'Best web design company’ is often the search phrase many businesses Google to find and then represent their business. Web design agencies will claim to be the award winning website design agency of choice for your business, and while we are recognised as a top E-Commerce Design & Development Company on DesignRush, most push their own agenda of selling a stunning website at the expense of your long term goals and objectives. Digital Rescue is the rare Melbourne Digital Agency that gives your company the expert advice and the health check your business actually needs, based on the current juncture of your digital journey. We invest the time to learn about your business more than any other agency, and ask the hard questions to help you gain and develop an even stronger position of clarity of how in fact you are positioned in the marketplace against your industry competitors. Its through this process that your identity helps formulate the website’s brand guidelines, the content, the voice and tone, the sitemap and every strongest possible high conversion design element to help your company grow. Beyond our website design capabilities we ask other highly relevant questions including; Where are you now in terms of your digital footprint via Adwords and Organic exposure online? Do you have organic rankings to protect before considering a redesign? If so what phrases are you ranked for and need to protect vs the phrases that you should in fact rank for that can drive a stronger return on investment for your company. Gaining the reputation as the ‘Conversion Focused’ Web agency, we are proud to reflect and share that our clients continue to experience up to a 600% increase in online conversions due to accepting, implementing and adhering to our web design and strategic conversion strategies. We don’t push our own agenda of selling you a new website blindly. We also don’t tell you what you want to hear, we tell you what you need to hear. Our ‘lay it all on the table’ advice and approach as to where you are at, where you need to be, and most importantly what you need to do first - is our priority. Digital Rescue’s consultative approach means that we give you straight answers as to where you are in your current online journey, and the tangible logical next steps required for your online success. Since 2007 the team at Digital Rescue have a cumulative experience of having reviewed 4000+ websites, design and development experience of over 400 WordPress Websites. 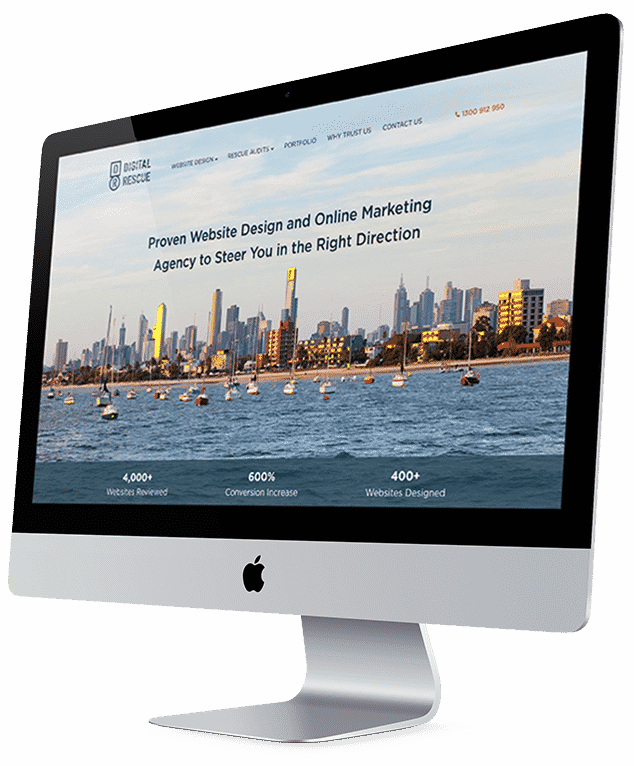 Beyond our Web Development background our agency is powered by the experience of a strong SEO capability through TopRankings our sister brand that continues to deliver results in some of the most competitive industry verticals in Australia. This combined approach to website design ensures your investment of a new website geared towards the delivery of a high conversion lead generating asset in your company.